Thoughts on design, strategy, and innovation. 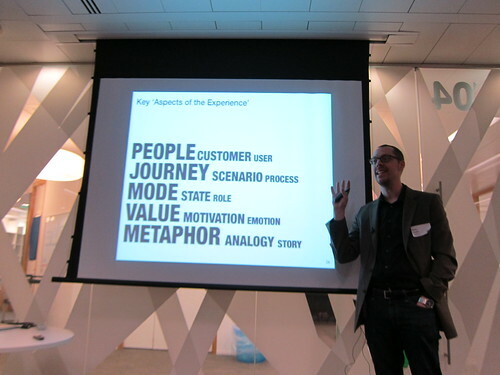 I recently gave a presentation at an event organized by the the UK Usability Professionals’ Association. The event, focused on UX & Strategy, featured talks by Tom Wood from Foolproof UX, noted speaker and UX professional Leisa Reichelt as well as myself. Tom and Liesa outlined their thoughts on the definition of experience strategy and how it could (or couldn’t) be successful in companies today. With luck, they’ll both post their presentations soon. I presented a related set of ’3 Myths of Customer Experience’ which sought to address some of the biggest red herrings in UX today. Ultimately, I want to turn ’myths’ into ’truths’ and introduce my definition of Experience Strategy as well as the critical notion of the ’Aspects of the Experience’. I took the time to record a voice over for the presentation and enabled a “Screencast” within Slideshare. The total running time is just under 18 minutes. Tweet me if you have any comments or questions. Cheers.